Straight to Wok Rice Noodles. 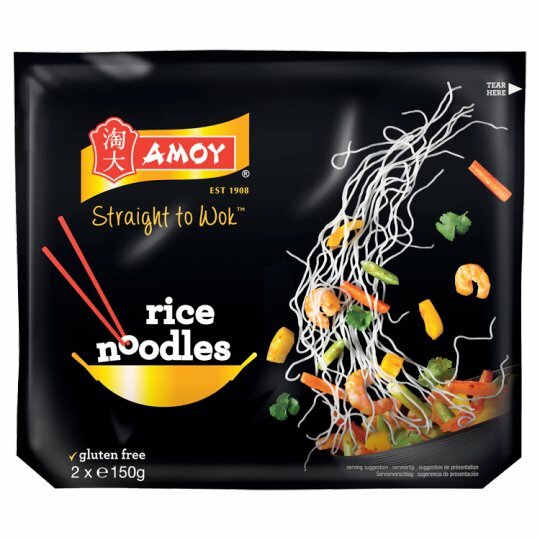 Quick, straight to wok noodles complete your stir fry. Once inner packet is opened use immediately. Microwave (From Ambient): (Based on 850 watt microwave): Remove all packaging. Empty noodles into a microwaveable bowl. Add approx. 10ml water (1 dessertspoon). Cover and heat on full power for 1 minute. Stir with a fork to separate noodles. Microwave ovens may vary, adjust cooking times accordingly. Two or more packs will require longer heating time. Stir Fry (From Ambient): Wok: Add to your recipe and stir fry for 1-2 minutes. Consumer Care Line Call Free (UK Mainland only) 0800 072 4090 (ROI 1800 9955311).